Mmm carrot cake! 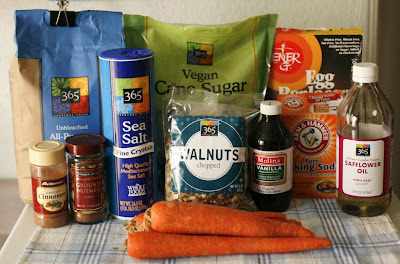 What's a better way to celebrate the carrot season than to bake your very own carrot cake! 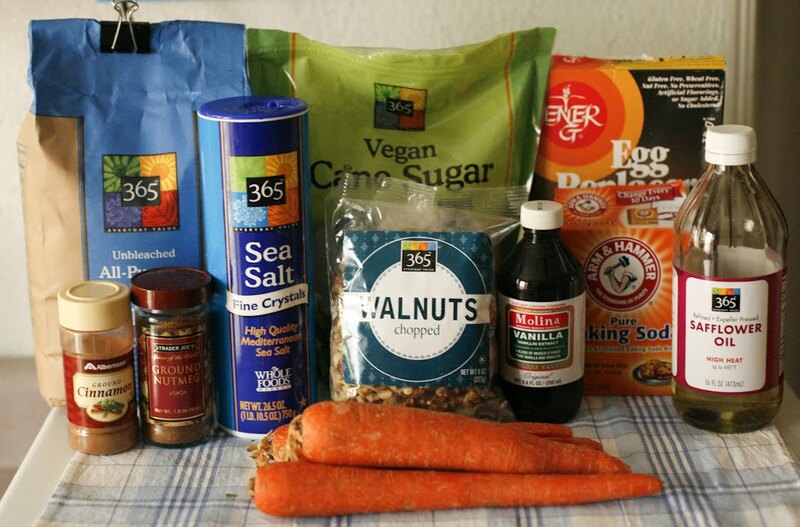 I remember buying carrot cake at my local market and reading the ingredients to find the list to include nearly a hundred ingredients and I'd say that 80% of them were unrecognizable to me. This cake is filled with nothing but organic and real ingredients. Only one small change I would make and that is to use flax seed instead of the egg replacer powder. I really wanted to but I forgot to buy some. If you happen to have flax seed at home, combine 1 Tb of ground flaxseed with 3 Tb of water and mix well. That will give you enough replacer for one egg. 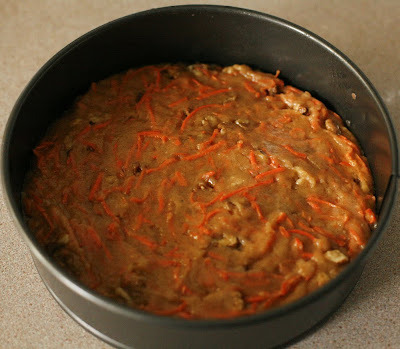 Okay I am not going to lie, this cake was amazingly good..so good that my boyfriend's little niece could not tell the difference between this and regular non-vegan carrot cake. But of course you know what makes this cake so good? Its all the added sugar! 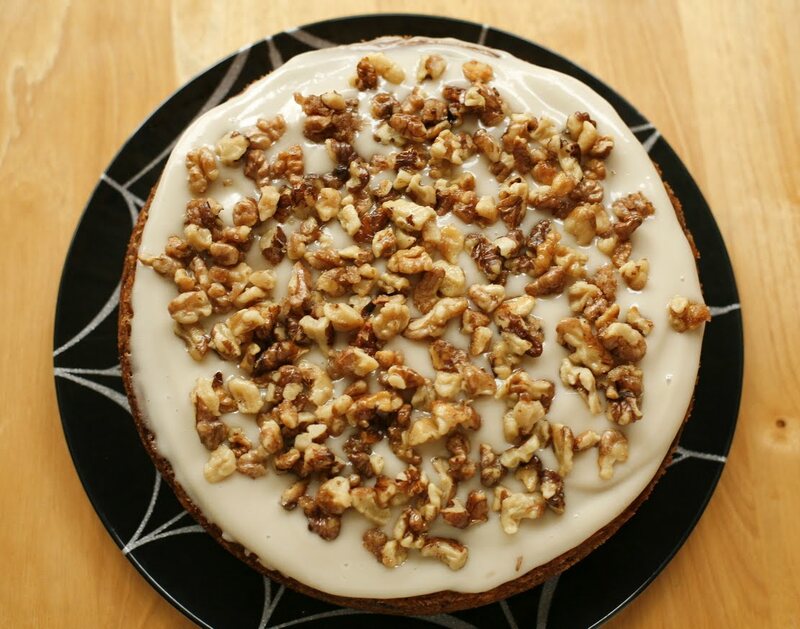 So much of it in the frosting, cake and candied walnuts. So if you do make this, please share, as I will. You can always cut back and not add the candied walnuts or the frosting. It would make a nice carrot bread type of dessert. One last thing I wanted to share with all of you. One of my favorite vegan fashion bloggers, Chic Vegan, has released an eBook that talks all about nutritional needs, vegan fashion, vegan cosmetics and what ingredients to look out for. So informative and best of all, she's allowing everyone to download it for free! Download it here. 1. Preheat the oven to 325 F and lightly grease a 13x9x2" baking pan or a 9" cake pan. 2. 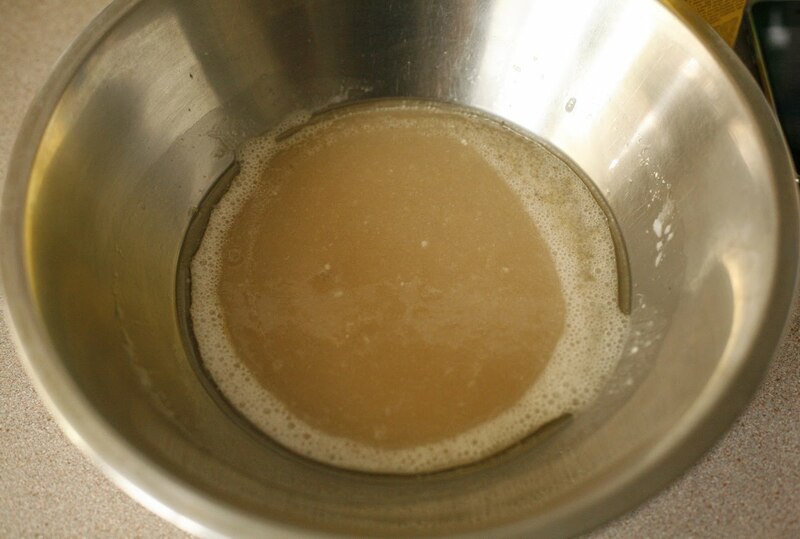 In a large bowl add the oil, sugar and egg replacer and beat for 1 minute with an electric mixer or by hand. 3. 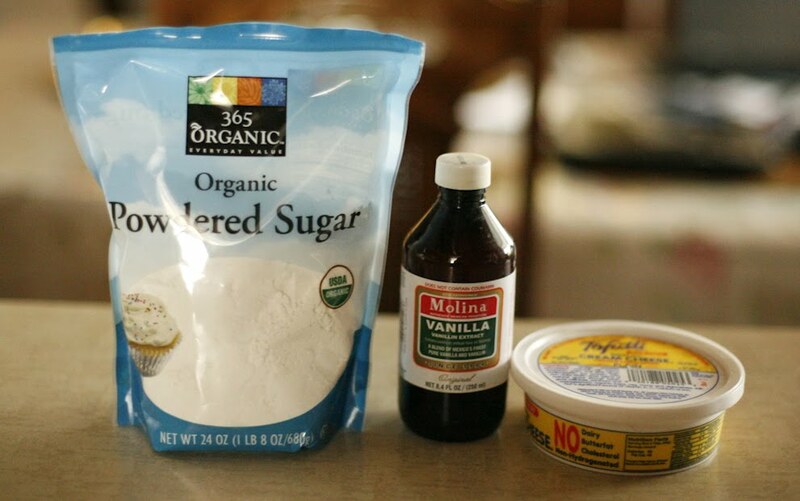 Sift in the flour, cinnamon, nutmeg, baking soda, baking powder, salt and add the vanilla extract. Beat for another minute. 4. Fold in the shredded carrots and chopped walnuts. 5. Pour in the glass or cake pan and smooth the top. 6. 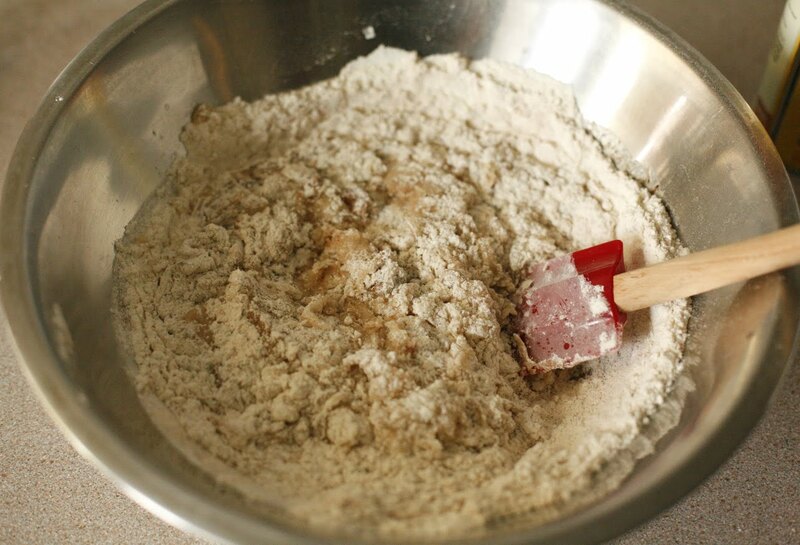 Bake for about 50 minutes or until a toothpick come out clean when inserted in the center. Place on a cool rack and allow to cool before adding the frosting. 7. To Make the cream cheese frosting, add all the ingredients and mix well until smooth. Spread evenly on top of the cake. 8. To make the candied walnuts : In a small frying pan over medium-high heat, melt the butter. Add the walnuts, sprinkle the sugar, and cook, stirring, until the sugar melts and the nuts are toasted and caramel coated. Set aside to cool. When it has cooled enough, sprinkle on top of the frosted cake. I used the recipe from here but added baking powder and changed the frosting recipe. 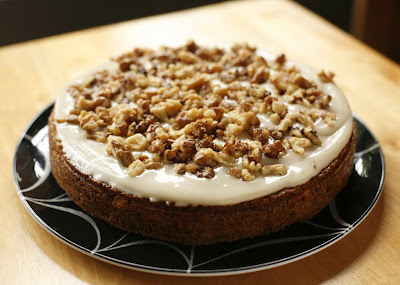 The carrot cake looks super! So is your photography! Like especially the very first one. That is a gorgeous cake! No margarine in the frosting? Whoa! Was great of you to post the recipe to this. Blogged it at Vegan.com. You're doing a great job with your blog. Love it! wow ! thanks for the recipe, the pie seems to be delicious ! 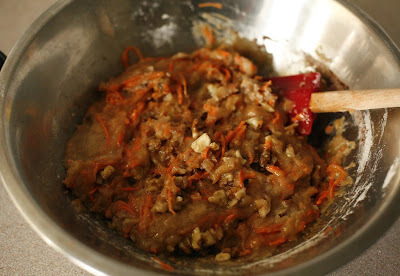 What's the easiest way to shred the carrots? Gina Marie - I used a little hand held shredder but I should have used a microplane grater. Try to shred them as small as you can with a shredder.